PC gaming can be fun but it’s also often expensive. As games get better looking (read: heavier to render and more complex), you need to upgrade your graphics card every few years to handle the increased load. This isn’t a huge problem for desktops, which let you swap out a single component for a newer one, but what about gaming laptops? They’re hugely popular, but a year or two after you buy one it might not be able to handle a new generation of games. Rather than buying new hardware, Nvidia wants you to try its cloud-based service. This is quite an ironic solution, coming from the world’s top-selling consumer GPU manufacturer, because it doesn’t need you to have a good graphics card. In fact you don’t need a graphics card at all. It’s called GeForce Now, and it’s a streaming service that renders any game in the cloud and streams the resulting frames to your PC through the Internet. Think of it as a Netflix equivalent for gaming. GeForce Now isn’t entirely new. It’s been one of the crowning features of Nvidia’s Shield TV Android-based media player. On the Nvidia Shield TV, you’re limited to the games that Nvidia has already set up in the cloud. While the concept remains the same, GeForce Now on Windows and Apple’smacOS lets you link your existing Steam or Uplay account to the service, thereby allowing you to run all the games you own, through Nvidia’s cloud. The addition of Ubisoft’s Uplay store is also new. Currently, GeForce Now supports six Uplay titles and over 160 Steam games, with more being added regularly. An Nvidia representative told Gadgets 360 that the company picks and chooses the most popular titles that gamers are currently playing and optimises those on priority, while working its way down the list. Does this mean I can play PUBG on an entry-level laptop? That’s essentially the idea here. 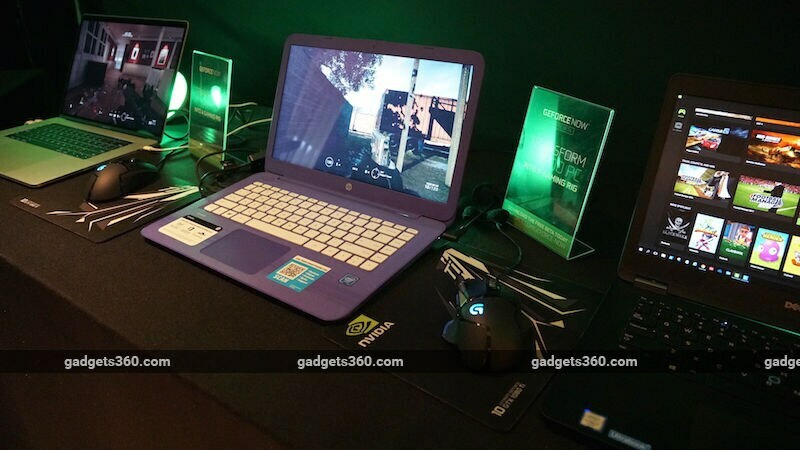 At CES, Nvidia had a couple of entry-level laptops from Dell, Acer and HP set up for a demo session. The games being shown off included Tom Clancy’s Rainbow Six Siege and Playerunknown’s Battlegrounds. We got to try out Rainbow Six Siege on the budget HP laptop (we were told it cost $200, or approximately Rs. 12,700), and it ran pretty smoothly. We didn’t encounter any lag in our short time with the game, and didn’t face any input latency issues either. According to Nvidia, the cloud service currently offers users the equivalent power of a GeForce GTX 1080. We then tried out Rainbow Six Siege on a 15-inch MacBook Pro with Touch Bar, which ran very smoothly too. You’ll need the GeForce Now client installed on your PC, after which you’ll be able to link your Steam and Uplay accounts. Once done, all your games should automatically show up in the GeForce Now interface. We didn’t get a first-hand look at the setup process but it seems as though it should be pretty straightforward. The GeForce Now app has two tabs on the left, called Games and My Library. The Games section shows you all the games that you own (pulled from your Steam and Uplay accounts), and once you install and start paying a game, it moves to the My Library section. You can see the full list of supported games on Nvidia’s website. ‘Supported’ games are already installed and running on Nvidia’s servers so you should be good to go in a matter of minutes. With these supported titles, you can save to the cloud in games that support doing so, which means you could start playing a game on your PC, and later pick up right where you left off on a Mac. Non-supported titles are essentially games that haven’t been optimised yet, and are still playable, but it will take 10-20 minutes to get them up and running as they have to be downloaded and installed on Nvidia’s servers first. You also won’t be able to take advantage of cloud saving, even if the game supports it, and according to Nvidia’s FAQ, you’ll need to reinstall them the next time you run Steam. Games streamed to your PC or Mac are currently capped at 1080p resolution at 60fps by default, but there’s an Ultra Streaming Mode that lets you go up to 120fps. You can tweak the graphics settings if you want, but ideally they’re best left to their defaults since Nvidia pre-sets them to optimal levels. Before you get trigger happy, there are a few of basic requirements that you need to keep in mind. While the company proclaims that you can turn “any PC or Mac into a high performance gaming rig”, there is a list of minimum requirements for GeForce Now. Mac users will need to be on macOS 10.10 or higher, and Nvidia has published a list of models that have been tested to have sufficient performance, with some laptop and desktop Macs going back as far as 2008 supported. For Windows PC users, you’ll need Windows 7 or higher along with an Intel Core i3 CPU running at 3.1GHz or more, 4GB of RAM, and a GPU no older than Intel’s HD Graphics 2000 series, Nvidia’s GeForce 600 series, or AMD’s Radeon HD 3000 series. GeForce Now requires a minimum Internet speed of 25Mbps, although Nvidia recommends a 50Mbps connection. Nvidia doesn’t specify any minimum or recommended upload and download ratio, but we were told that the download speed is the most important factor since the only data that needs to be uploaded is your key presses and mouse movements, which don’t need a lot of bandwidth. At the demo area, we were told that all the laptops were hooked up to 50Mbps wired connections. You can use Wi-Fi, but you’ll need a 5GHz setup all around. While there is a chance that Nvidia’s demo area could have been set up as a very controlled environment (using a local server, for instance) in order to minimise glitches during the demos, we were informed that the games were in fact being streamed from Nvidia’s data centre in Santa Clara. Considering that GeForce Now is essentially streaming video frames to your PC or Mac, data usage is a major factor to keep in mind especially if you have a fixed data cap per month. Nvidia hasn’t published any data consumption estimates. However, a peek at Nvidia’s forums gives us some insight into what you can expect. We assume that data consumption will vary based on the resolution you’re streaming at and the quality settings you have selected, just like with any on-demand video streaming service. GeForce Now is currently restricted to North America and Europe (and Nvidia only has datacentres in those regions), so it’s not available in India yet – well officially at least. GeForce Now is accessible using Nvidia Shield devices in India without the use of a VPN as we discovered late last year, though the company has been mum on plans for an official release. Nonetheless, we’ve signed up for the GeForce Now waitlist and you’ll be the first to know when we can start using it in India on Windows and Mac. GeForce Now is currently a free service and in beta. Interestingly, Nvidia says is not planning to go down the subscription route like it did with the Shield TV. The reason for this is simple – since Nvidia isn’t providing you with any games, it doesn’t want to charge a fixed premium. Some users might have 10 or 15 games that they play regularly, while others might own or want to play just one or two. Nvidia says it hasn’t zeroed in on a pricing model yet and is currently focusing on improving the user experience based on feedback.